One last edition of recent reading roundup for 2013, before the obligatory summary of the year's reading (coming on December 31st and not a moment sooner, she said, glaring darkly at certain people and publications who list their favorite reads of the year in November, for pity's sake). This one comes with a particular slant--a few weeks ago, I received a care package from NYRB Classics, that delightful purveyor of rediscovered, unjustly forgotten works in beautiful packaging. Since I already had a few of their books in my TBR stack, it seemed appropriate to end the year with an NYRB Classics binge (plus one other book). Not all of these books are ones I would have selected for myself, but the result has been to shine a light on some corners of literature (much of it in translation) that I might not otherwise have explored, and it reminds me once again just how valuable this imprint is. 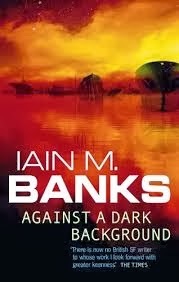 Against a Dark Background by Iain M. Banks - Since Banks's tragic death earlier this year, I've found myself rationing his remaining unread books, all too aware that there will never be any more. For my first dip back into Banks's bibliography, I chose Against a Dark Background, which turned out to be a questionable decision--it's certainly not the book that can sustain the goodwill and fond feelings aroused by Banks's passing, indulging as it does in so many of his worst writerly tics (another way of thinking about it, of course, is that it was better to get Background out of the way, so that my last experience of Banks's science fiction will hopefully be a more positive one). Set outside of the Culture sequence, Against a Dark Background is the story of Sharrow, an aristocrat and former soldier whose family has been in a decades-long feud with a fanatical religious cult, who believe that their messiah can only be born after Sharrow's female line is destroyed. When the cult wins the legal right to hunt Sharrow for a year, she rounds up her former war buddies and goes in search of the only thing that could buy back her life, the last remaining Lazy Gun, a weapon that kills by altering reality so that its target finds themselves in lethal circumstances. The Lazy Gun is only one of the many ornate, borderline-ridiculous details of Against a Dark Background's worldbuilding, which is baroque even by Banksian standards, and as will occasionally happen in his writing the novel's story and characters are buried under all this invention. As in Banks's debut, Consider Phlebas (with which I was not impressed), the relatively simple treasure hunt story is related in a series of set-pieces whose purpose is mainly to show off Banks's gonzo inventiveness and the characters' smallness before the enormous, bizarre universe they live in. And as in that novel, the result is an airless slog, impressive for the work that has gone into each of its settings, but lacking any sort of propulsive storytelling or compelling characters. Unlike Consider Phlebas, however--which gave the Culture series a useful grounding in establishing the horrors of the Idiran war but whose worldbuilding felt superfluous to that point, as if Banks were merely showboating--Against a Dark Background's overstuffed setting ties into the novel's central idea, of a society being crushed by the weight of its own history. Approaching its "deca-millennium," Sharrow's civilization is overburdened by ancient laws, ancient institutions, and ancient social conventions, as well as a myriad competing philosophies and factions, all fighting over ground so well-trodden that no one could ever truly own it, making change and progress all but impossible. It's a grim idea, made even grimmer by Banks's conclusion that there is no escaping it except through total destruction (and perhaps not even then), and reflected in Sharrow's own cynical, self-destructive personality. Banks does a good job of laying out just how Sharrow became the hardened, self-absorbed person that she is--she's not only lived her whole life under the shadow of an assassination plot that claimed her mother when she was very young, but has also lived in a toxic combination of unlimited power (as an aristocrat in a society completely beholden to its past) and terrifying vulnerability (as an impoverished young woman whose relatives are either neglectful or actively predatory). But this doesn't make her any more pleasant to read about, especially when her adventures destroy and even end the lives of the people who are caught up in them. Against a Dark Background is a deeply cynical novel--grimdark from before grimdark was even a thing--and Banks is certainly a skilled enough writer to pull that sort of thing off (though he seems to have flinched a little--after the book's publication he released a consolatory epilogue which puts a slightly more positive spin on Sharrow's story), but between that grimness and the novel's stifling worldbuilding, it's an almost punishing read. Though that may have been Banks's intention, I'm glad that I still have other books by him to look forward to, which can wash the taste of this one away. 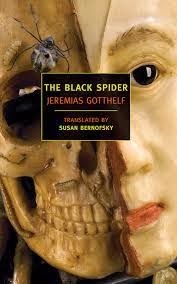 The Black Spider by Jeremias Gotthelf - Published in 1842, this slim novella is a horror story with a strong religious component that, to me, somewhat undermines its power. On a beautiful Sunday afternoon, a rural community gathers to celebrate a christening in one of the neighborhood's oldest and most respectable families, whose grandfather suddenly begins to relate a tale of terror: how, hundreds of years ago, the peasants of the region made a deal with the devil to help them complete an impossible task set for them by a tyrannical feudal lord, in exchange for an unbaptized baby. When the peasants try to trick the devil by baptizing the babies born in their community in secret as soon as they're born, he sends the titular black spider, a monstrous creature whose very touch causes death, and which terrorizes the community until one brave, pious woman manages to trap it. Described in a few sentences, this seems like too simple a story to sustain even this short volume, but Gotthelf weaves it well, in particular the details of the community, past and present--their terror of the cruel knight, their debates over whether to take the devil's deals, the slow acceptance, when the black spider appears, of the necessity of giving up a baby. The Black Spider is at its best when it focuses on human frailty--whether it's the peasants turning on each other and refusing to accept blame when the consequences of their choice come back to haunt them, or the knight realizing that he's painted himself into a corner by forcing his serfs to sell their souls but being too proud to admit it, or even the framing story, in which the seemingly benign customs of the christening lunch conceal status anxiety and simmering resentment. But Gotthelf (the pen name of Albert Bitzius, a Swiss pastor and reformer) is far more interested in his story's religious component, repeatedly stressing the peasants' religious failure--their choice to make a deal with the devil, which damns them irretrievably--over their failure as neighbors and members of a community. Coupled with the uncomfortable fact that the characters responsible for the devil getting a foothold in the community are all women, whose core failing is being insufficiently modest and self-effacing (while the woman who traps the spider is praised for her piety and self-sacrifice), this makes for some frustrating reading. At points, The Black Spider is genuinely scary, in both its supernatural and human components, but its author's worldview is too present, and too incompatible with mine, to make it a perfect read. Red Shift by Alan Garner - Garner is well-known in the UK as the author of YA fantasy, but Red Shift, a strange not-quite-time-travel novel, was my first encounter with him, and it leaves me both curious and a little hesitant about exploring his writing further. Strictly speaking, Red Shift isn't really a genre work. It proceeds in three parallel plot strands--in the 2nd century, the 17th century, and the 1970s--but, though there are hints that these three stories are bleeding into each other, for the most part this feels more like a literary device than an actual fact of the novel's world, and the connection between the three strands seems more thematic than factual. What gives Red Shift its genre feel is its style, which switches between the three time periods with no warning, sometimes mid-paragraph, and gives the reader so little information with which to ground themselves that working out where, or when, we are in any given segment of the book becomes an act of investigation, making this rather slim volume a slow, almost painstaking read. That opaqueness extends to the events within each of the three plot strands. In the distant past, a few defectors from the lost ninth Roman legion try to survive amidst the violent British tribes; in the 17th century, the residents of a small English village barricade themselves in the church when marauding French troops are spotted; and in the recent past, a emotionally unstable young man tries to maintain a long distance relationship with his girlfriend, whose career aspirations, in stark contrast to his lack of prospects, threaten to take her even farther away from him. Working out these details, however, means battling against Garner's deliberate refusal to do any worldbuilding work--to explain what the legionnaires mean when they talk about Cats and Mothers (the names they give the local tribes), or why Tom and his girlfriend Jan are in the kind of financial and social straits they find themselves in. This has the effect of making Red Shift seem almost hallucinatory, an effect that is intensified by the frequent shifts between time periods. It also has the effect of making the modern love story--which is paralleled with different relationships between characters who are clearly intended as Tom and Jan's stand-ins in the other time periods--feel like the novel's most central, most important element, even when contrasted with the violence and high stakes of the other plot strands. When that relationship crumbles, under the weight of difficult circumstances and Tom's emotional problems, Garner's stylistic choices and time-shifting storytelling intensify that loss until it feels like the world-shattering event that Tom perceives it as. 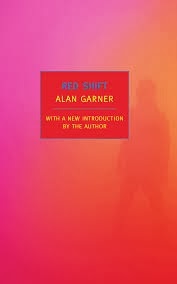 By its end, Red Shift is a powerful, disorienting, and discomforting book, but this doesn't quite erase the memory of how difficult, and often frustrating, it was to get through and puzzle out, which makes the prospect of continuing to read Garner a not entirely appealing one. 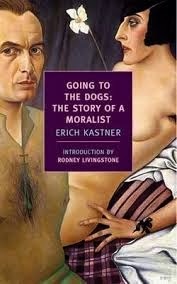 Going to the Dogs: The Story of a Moralist by Erich Kästner - One of the few authors to escape the blanket rejection of anything German that was riding high in Israeli society as late as the 80s, Kästner's children's books have been a staple of Israeli juvenile culture for decades, to the point that he seems almost to have been adopted into the culture (HaBima's production of Pünktchen und Anton, adapted by noted Israeli humorist Ephraim Kishon, is deservedly considered a classic of Israeli children's theater). His work for adults, however, has for the most part remained undiscovered, even by this appreciative audience--a brief attempt to translate his adult-oriented mystery novels in the late 90s seems to have fizzled out. The present moment, however, in which wartime European novelists like Hans Fallada, Irmgard Keun, and Hans Keilson are enjoying the same newfound popularity in Hebrew that they have been in English, seems more hospitable to a rediscovery of Kästner, and I'd be curious to see whether Going to the Dogs (originally published as Fabian in 1932), will make the transition into Hebrew (not least because I think that Kästner's dryly witty, staccato style translates much better into Hebrew than English). In the meantime, however, we have NYRB Classics' edition, and what it reveals is a novel that, under the guise of Kästner's familiar, slightly old-fashioned tics--as in his children's books, for example, he maintains he 19th century affectation of opening each chapter with a summary of its events--is a quietly devastating, deeply political work. The hero, Fabian, is an advertising copywriter in 1920s Germany, whose life teeters, and eventually falls off, a knife's edge. Jobs are being eliminated overnight, even the people who do have jobs can't afford to live off their earnings, and the only people offering solutions, from the left or the right, are totalitarians and thugs. Unable to move on with their lives or hope for the future, Fabian and his friends resign themselves to short-term pleasures, to drunken debauchery and anonymous hook-ups. But Fabian, as the novel's subtitle tells us, is a moralist, and can't help but stand in priggish judgment of himself and his society, even though he has no better solution. As a portrait of pre-war Germany (and an indictment of the "reasonable" middle class who allowed themselves to be dragged into Nazism because they lacked the conviction to demand or offer an alternative), Going to the Dogs is masterful, evoking both pity and rage at the blindness with which Fabian's society stumbles into war. But there are also aspects of the novel that feel universal, and particularly relevant to the present moment, as when Fabian interacts with his elders--his father and his former teachers--whose generation embroiled their country in war and economic collapse, but who are short-sightedly incapable of seeing why the younger generation can't achieve the same things they did, and blame it on the laziness and shiftlessness of youth. It's a reminder that some things never change, and that our present moment holds dangers that we haven't fully comprehended, so it's a shame that Going to the Dogs has such a glaring blind spot when it comes to its female characters, who often bear the brunt of Fabian's moralism. Whether they sell their love (usually the only thing they have to sell), or give it away for free, Fabian seems to regard women in the same position as him with blanket disapproval, and Kästner depicts them, almost universally, as either predatory or weak, but never as complicated or sympathetic as his male hero. It's an unfortunate blemish in a novel that otherwise feels achingly relevant. 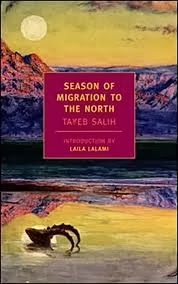 Season of Migration to the North by Tayeb Salih - Sofia Samatar recommended this novel in her list of five Arabic novels to read before you die. It was also selected as the most important Arabic novel of the 20th century by the Arab Academy in 2004 (which is why it was my first stop on Sofia's list), and having read the book, even without a grounding in any other Arabic literature, I can see why. In a deceptively slim volume, Salih somehow manages to cover an enormous range of topics--colonialism and post-colonialism; tradition and modernity; the life of an assimilated Arab in Europe and the life of a European-educated Arab back in his home country; government corruption and local politics; the life and relationships in a small village; relations between men and women, whether governed by traditions and social mores or the flouting of them; the dread of what a post-colonial future will bring to the Arab world. That Salih manages this at all is stunning, but that he does so in a book that is as artful, as beautifully written, and as touching as Season of Migration to the North is almost impossible to believe. The core story involves the Sudanese narrator returning to his home village after getting his education in England, and growing curious about a new neighbor, who obviously shares his education but conceals it, and his past. This beginning, however, promises a much more straightforward story than Salih ends up delivering. The neighbor, Mustafah Sa'eed, dies shortly after his introduction, and the narrator intersperses his investigation into Sa'eed's past with the day-to-day details of his life, which include observing how modernity (which often means Western values and technologies) encroaches into life in the Sudan, and how its folded into the old ways of life, both good and bad. At times, Migration feels aimless, a portrait of the Sudan at its present moment--the scene in which the narrator listens to the old people of the village discuss marriage and their sexual history is funny and vivid but seems to exist solely to give us a sense of how life in the village works. At others, it seems to reject this kind of realistic portrait-painting for a more overheated allegory of Arab-European relations--Sa'eed, we learn, had a string of lovers in England, all of whom were drawn to his exoticism like moths to the flame, and with the same self-destructive results, and his defining trauma was a marriage to a woman whom he could neither love nor leave, and whom he ended up killing. That these very different modes tie together well enough to feel like organic components of the same story, which is simultaneously allegorical and realistic, is yet more evidence for how great an achievement Migration is. In fact, if I have any criticism of Migration, it's that it feels too big, too all-consuming, too definitive, as if its statements about the role and influence of European colonialism on Arab countries had settled the matter once and for all, leaving no room for anyone to add anything to the conversation. I'm sure, however, that that's not the case, and happily I have the rest of the books on Sofia's list to look forward to. 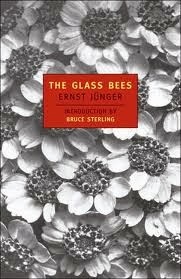 The Glass Bees by Ernst Jünger - At first glance, Jünger appears to sit well with those other rediscovered pre-war and wartime European authors I mentioned in my discussion of Going to the Dogs above, but a quick glance at his biography suggests a less savory story. Jünger appears to have had a talent for standing just to the left of the wrong side of history, somehow managing to talk his way out of meaningful consequences for his associations. You wouldn't necessarily know that from The Glass Bees, however, which feels almost like a companion piece to Going to the Dogs. Though published in 1957, it is set, like Dogs, after a world-changing war and in the midst of economic upheaval, but its setting isn't precisely our world. The narrator, Richard, is a former cavalry officer who made a career change to armored weapons acquisition after his branch of the military collapsed, and who played a small, unsung role in the not very peaceful transition from monarchy to republic. This biography largely tracks with events in Germany during and after WWI, but Jünger's descriptions are vague enough (and in some cases deliberately universalized--Richard's name, like the names of many of his former colleagues in the army, is English rather than German) that The Glass Bees feels as if it takes place in its own invented world. This feels particularly true when Richard is offered a job working personal security for Zapparoni, an industrialist who sells robots who do everything from performing household tasks to working in factories to appearing in movies. The novel itself only covers Richard's interview with Zapparoni, and the bulk of it is filled up with his reminiscences of the world of Empire, honor and tradition in which he grew up, and with his observations about what the world has become now that these have been lost, with the interview giving the story only the very flimsiest of skeletons on which to hang these reveries. Some of these interludes are extremely well done--Richard is cynical and sardonic as only a former idealist can be, and his stories of his training in a doomed type of warfare, and of the people who failed to make the transition from the more courtly world he grew up in into the more crass world of the present, are affecting without being too sentimental about that lost world. So, too, are his musings about the effect of technology on society, which are sometimes eerily prescient. Zapparoni is an almost Steve Jobs-ish figure, and Richard's analysis of the miniature high-tech industry he spawns, and of the effect of his robots on society, feels utterly of the moment. Analysis, however, is very nearly all that Richard does, and The Glass Bees often lapses into long stretches of him telling us, rather than showing us, what a world with Zapparoni's technology, and his power as a super-rich industrialist, looks like. In these segments, Richard's sardonic tone works against the novel. He comes off like a blowhard, who likes to show off how well he understands the world even though the actual circumstances of his life--a disgraced military officer with so few prospects that he's forced to take a shady job which will almost certainly lead to an early death--by no means justify his superior, knowing tone. In its best moments, The Glass Bees is a feat of worldbuilding whose power is rooted in being both strange and familiar, historical and futuristic. But in its worst moments it feels as if Jünger has sat us down for a long, meandering, self-satisfied lecture. The two modes alternate enough that there's a lot here worth reading for, but the end result is far from satisfying. 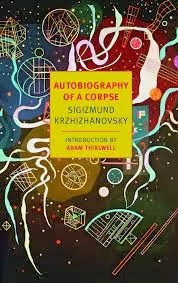 Autobiography of a Corpse by Sigizmund Krzhizhanovsky - A lecturer on theater and culture in Imperial and then Soviet Russia, Krzhishanovsky wrote for decades fiction that was absurdist and surrealist, and thus banned by the Soviet censorship. His fiction wasn't rediscovered until decades after his death, and Autobiography of a Corpse is one of the first published collections of Krzhizhanovsky's stories in any language. What's interesting is that the stories here address political issues only obliquely, if at all--in the title story, for example, the protagonist receives a letter from the previous inhabitant of his room, who committed suicide in it, which references WWI and the revolution, but only as background details. What was presumably considered dangerous and seditious about these stories is not anything in their content, but their treatment of the world as something fragile, a thin membrane of normalcy which is little more than an agreed-upon delusion. In "The Collector of Cracks," for example, an author attempting to harness fairy tales to deliver easily digestible, middlebrow irony encounters the title character, who has seen through the facade of reality that even fabulist fiction relies on for its power. Some stories are driven by absurdist premises: in "In the Pupil," the narrator believes that a woman loves him only while he can see his reflection in her pupil; when this reflection, a tiny version of the narrator, materializes in the real world, he reports that the reflections of all the beloved's previous lovers are trapped in an oubliette behind her eye, reminiscing about their past with her and trying to work out why she fell out of love with them. In "The Unbitten Elbow" (one of the more overtly political stories in the collection), a man announces that his greatest ambition is to bite his elbow, and becomes a celebrity, whom the authorities use as a distraction and as a way of conning money out of the public, all while he devours himself in pursuit of his goal. In other stories, however, Krzhizhanovsky's musings about the thinness of reality seem disconnected from any concrete plot elements, however strange or surreal. Stories like "Postmark: Moscow" read more like stream-of-consciousness musings about the nature of the titular city, and I found them tougher going. Autobiography of a Corpse is split fairly evenly between these two types of stories, and thus offered mingled pleasures and frustrations, but it is nevertheless clearly the work of a remarkably assured writer, one whose rediscovery hasn't come a moment too soon. A very interesting bunch of books. Regarding the only one I've read - Against a Dark Background, I have to disagree that it is an airless slog. It's been a long time since I read the novel, but I recall at the time being impressed by both Banks imaginative powers and the plot. As a writer Banks wasn't without his flaws, but I believe that novel was particularly impressive. 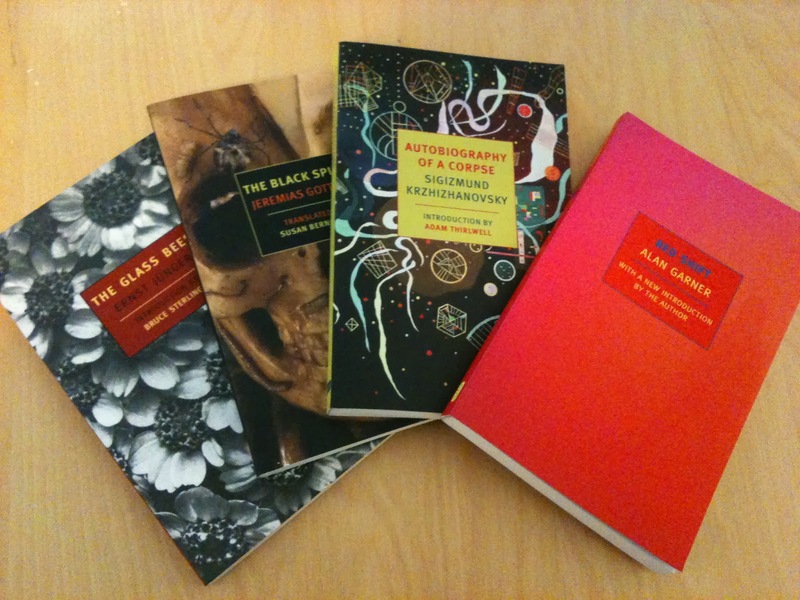 As for the other books you've reviewed - The Black Spider sounds fascinating and I'll have to track it down. Also Red Shift is one I've been meaning to read for years as Garner is a relative of mine on my mother's side. I'm sure that you would agree that often a novel's flaws are just as interesting as its strengths. Nice blog - I'm impressed.